The Mental Health Strategic Plan sets the course for the services direction and development. The plan grew out of collaborative, consultative, and strategic body of work that takes into account all stakeholders in the system including individual people who have experience with mental health issues, experts and academics, and State and National needs. The process of planning is an ongoing one that seeks to build on the work of previous plans, set a clear path forward and foster collaborative alliances. The districts population is ageing, with the number of residents aged over 70 projected to increase by 29 per cent over the next decade. The growth in the aged and the older population of SLHD is especially important for healthcare delivery over the forthcoming decade, with an increase of 29% in the 70-84 age group and 28% in the 85+ age group predicted. Around 40% of the SLHD population are born outside of Australia and many people are a cultural and linguistic blend. The major languages spoken include Chinese languages, Arabic, Greek, Korean, Italian and Vietnamese. According to the 2011 Census, suburbs such as Campsie, Haymarket, Lakemba, and Wiley Park have 50% or more of their population speaking a language other than English at home. Sydney district is characterised by socio-economic diversity, with pockets of both advantaged and disadvantage people. The Local Government Areas with the highest proportion of welfare recipients include: Canterbury, Marrickville and Ashfield. Mean taxable income is lowest in the Canterbury Local Government Area, which has a higher index of disadvantage than the rest of the State. According to the 2006 Socio-Economic Index of Disadvantage, the most socioeconomically disadvantaged suburbs in Sydney Local Health District include Belmore, Campsie, Greenacre, Haymarket, Lakemba, Punchbowl, Riverwood, Waterloo and Wiley Park. A significant Aboriginal population resides in the Sydney Local Health District, mostly located in the Redfern/Waterloo area, the City of Sydney and in Marrickville. Aboriginal people are widely recognised as having poorer health and poorer access to appropriate health services. Professor Marie Bashir Centre located within the Royal Prince Alfred Hospital precinct. We also have 5 community mental health centres and their associated specialist teams. We employ over 800 dedicated staff who work in many professions, departments and roles to make our service one of the best in Australia. 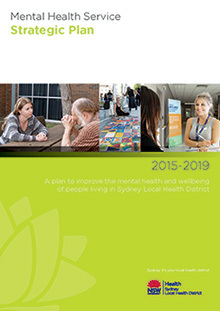 The total annual budget for the provision of mental health services in the Sydney Local Health District is over $90 million. Improving the mental health of the community requires collaborative working relationships with many partners. These include the private sector, the non-government sector, other Sydney District health services and related government services such as education, child protection, youth, employment, housing and homelessness, aged care providers, police and the justice system.